2014 brought us a good number of Malaysian startups that got us fairly excited. From sites that can connect you with the job of your dreams to sites that will find you the perfect person to get the job done for you, there is no lack of variety in what creative Malaysians have come up with in 2014. While some will only be available later this year, most of the sites here are readily available for your convenience. 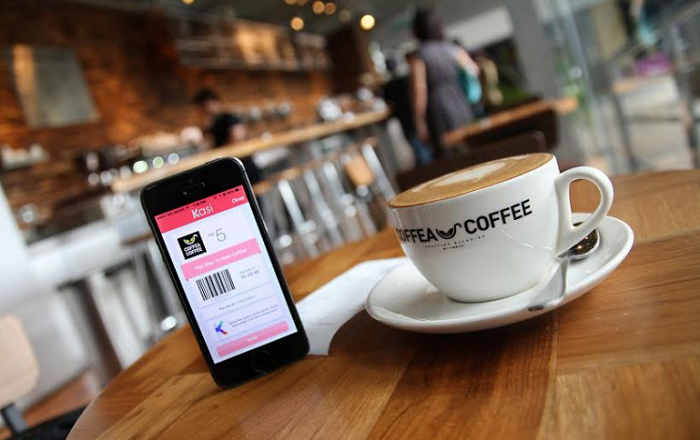 Here’s a list of the Malaysian startups that we should all be using in 2015. Offpeak.my is a website where customers can book and enjoy discounts at a wide variety of restaurants. The ingenious site also serves as a platform for restaurants to fill up their empty tables during non-peak-hours by offering discounts. The great thing about booking on the site is that you don’t even have to book hours or days in advance! Reservations are taken 10 minutes before the nearest time slot so you can access the site on your way there. We spoke to the founders, Tan Ban Eu and Lau Ngee Keong, in October 2014 where they revealed their big plans for Offpeak.my. Launched on August 2014, they are hoping to expand their coverage to more regions in Malaysia as well as kickstart their mobile apps. With the fast-paced work in today’s society, having an app that lets you book last minute slots at a discount is bound to be picked up by Malaysians. 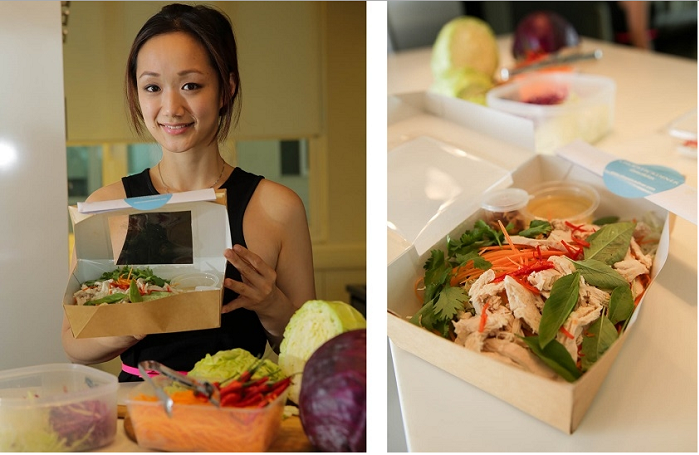 Chopstick Diner is a healthy food delivery service kickstarted by food technologist and food stylist, Elaine Ho. She initially used the site to share recipes but later came up with the idea to offer lunchbox delivery services. People are getting more and more self-conscious with the food that they put in their body. Chopstick Diner lets Malaysians continue their busy work lives while staying healthy, food-wise. We talked to the Elaine and was shocked to hear that she only started her blog in August 2014. At the time of our article (late October 2014), she was handling up to 100 orders a day! Give this healthy food delivery service a go. At RM20 per box, you’ve got nothing to lose (but weight). 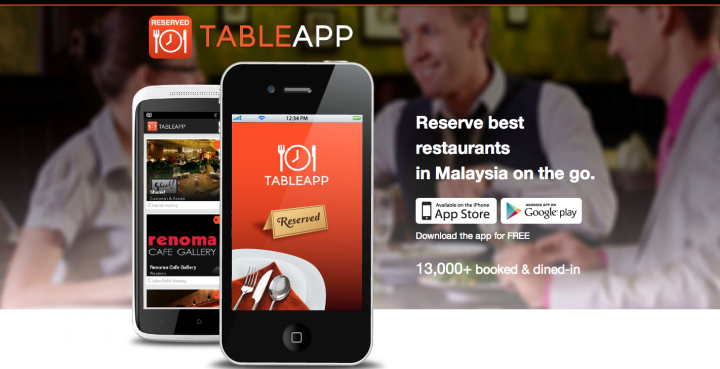 TableApp aims to make simplify restaurant bookings by providing free online restaurant reservation service for diners and guest-management solutions for restaurateurs. The website allows users to choose a place and restaurant, check for availability and reserve a table without having to go through the individual restaurant sites itself. This would definitely be taken with enthusiasm by food lovers who are less enthused by long waiting lines. Co-founder of TableApp, Benson Chang, told Vulcan Post that the app has had over 1,000 downloads in January 2014. The current number of installs on the Google Play store alone stands in between 10,000 and 50,000 downloads. 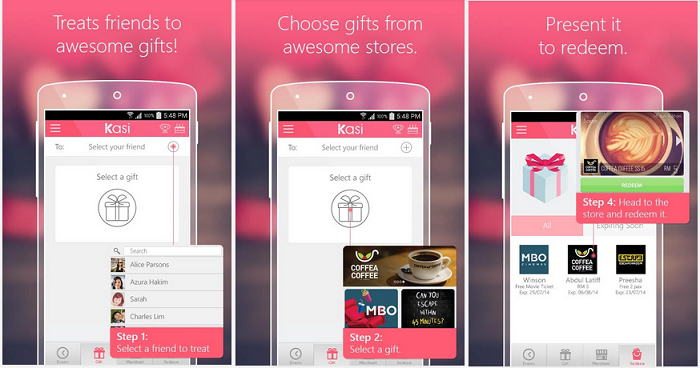 Kasi is a gift-giving app that links consumers to brands, allowing users to give gifts to their friends and often free of charge! There are, of course, gifts that you can purchase for a small amount of money in order to present to your friends too. Co-founder Xu-Zonne shares that they hope to shorten the bridge between retailers and consumers in a fun, secure and engaging manner through the use of the app. The app is currently available on Android and iOS, though the team is working on creating new versions of the app for different platforms. There are a good deal of free things to share on the app, which is bound to get the attention of anyone who loves free things (that’s everyone). Socialwalk is a website that allows business owners, specifically buyers and suppliers, to build a work relationship together. The team aims to help users connect with the right buyers, suppliers and partners in order to make successful business transactions. According to their site, the users in Socialwalk are talent-spotted and has undergone their training to ensure quality and consistency in their service. 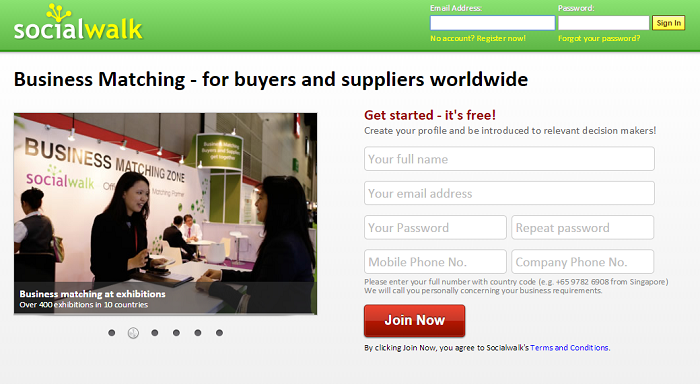 If you’re interested in joining them as a buyer or supplier, check out their website. This simplified way to get connected with the right people is sure to be a valuable addition to the world of e-commerce. Wobb is short for “working on bean bags”, which is the philosophy that founder Derek Toh is going for with his site. The culture plays a vital role in the selection of a job. While some might find that strict working environment conducive, others prefer a more casual work environment. 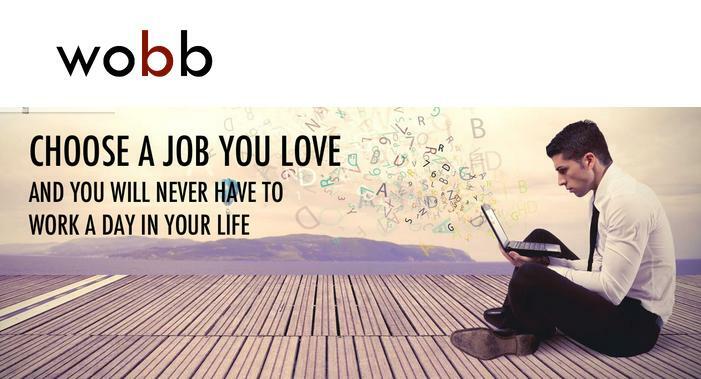 Wobb allows the job-seekers to have an in-depth look into the company and look how it runs before joining. Derek Toh shared with Vulcan Post that he hopes Malaysians will find jobs that they love instead of working for just money. GoGet is an online marketplace for errands and deliveries that connects people who need help to run errands to those who have the free time to get things done. GoGet is currently at its beta phase with coverage areas at Bangsar, Damansara Heights, Mont Kiara, Hartamas, Petaling Jaya, KL Sentral and Mid Valley. Whether you need something done real quick, or have the free time to earn some extra cash, GoGet is a fairly new concept in Malaysia that Vulcan Post will keep a lookout for in 2015. Recomn.com lets you list your business for free in order for customers on the site to get the best quotes and introductions for the jobs they need done. Whether you’re looking for someone to fix your car, or a class to learn how to bake, Recomn will have the introductions as you request them. With thousands or services available, consumers simply don’t have the time or resources to sieve and filter through them one by one. Recomn.com recommends the professional to get the job you want done, done for you. 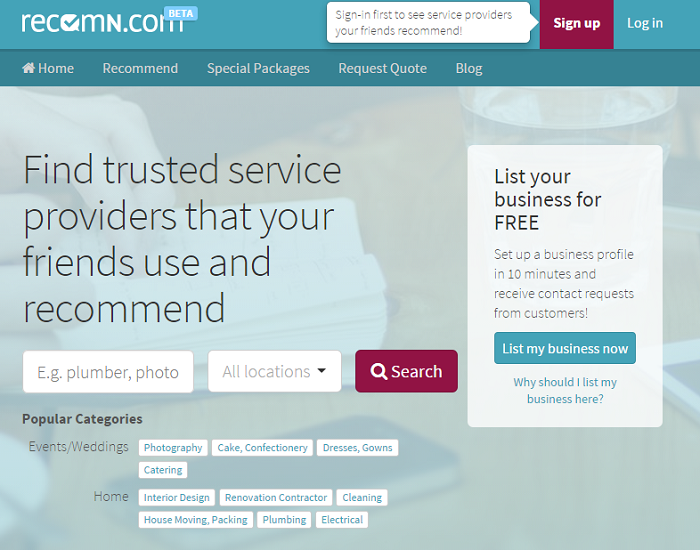 Like Recomn.com, Kaodim connects service providers and consumers with each other. The user submits a request for the service they require and answers a series of questions specific to that request. The professionals who are able to meet those demands will then get access to the request, after which they can choose to respond or otherwise. Customers will then be provided with a choice of 5 customized quotations from five different service providers, complete with personal introductions regarding the service providers. The ease at which the customers and service providers are linked to one another has been accepted with enthusiasm by Kaodim users. If you have a service to offer, list it up on the site for free. 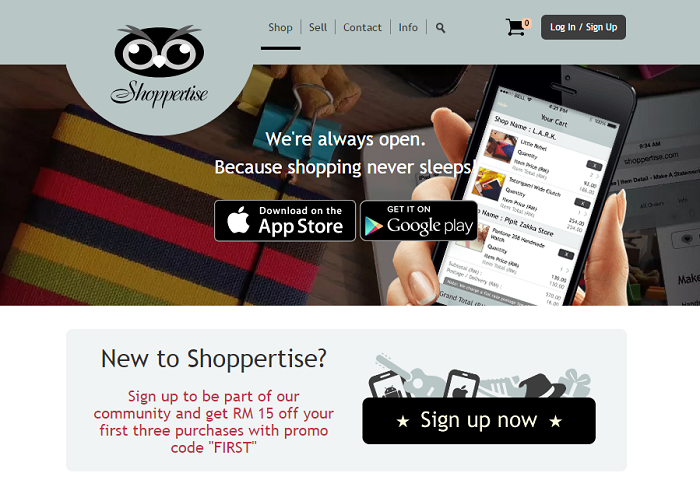 Shoppertise lets you not only buy on it’s site, but also sell as well. The online store set up lets you buy in a marketplace that is filled with items hand-picked by the team in Shoppertise and sell via a simple mobile commerce platform. The Shoppertise app lets you snap a picture of the item for sell on your phone, share them and sell them. While some items are uploaded and sold by users, other merchants are chosen and strictly moderated by Shoppertise. That said, all items on the site are carefully vetted so that the buyers can have a good shopping experience. This site is available on the web, Apple App Store and Google Play store. 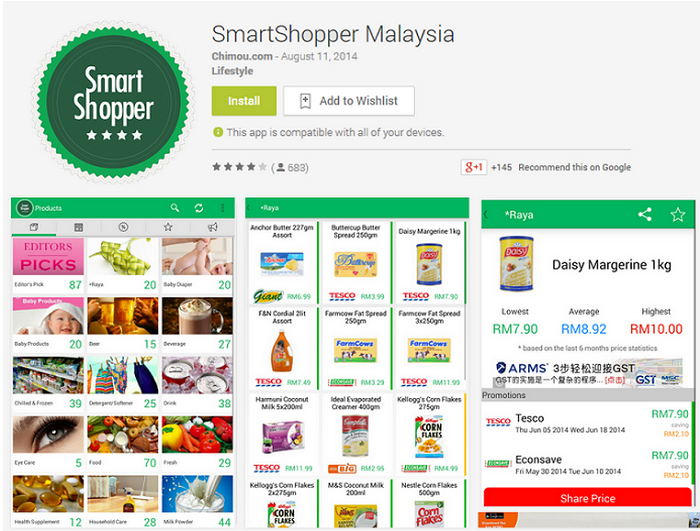 SmartShopper Malaysia is able to track the price and promotion of items from more than 80% of the retailers in Malaysia, simplifying your “Where is the cheapest place to get this [insert item here]?” dilemma. The items on the site range from baby products and detergent, to beer and pet food and lets you see what prices it’s been offered at different stores. Every penny counts and this app is bound to help you save up on whatever it is that you are itching to get your hands on. The app is available on the Apple App Store, BlackBerry World, Google Play Store and Windows Store. 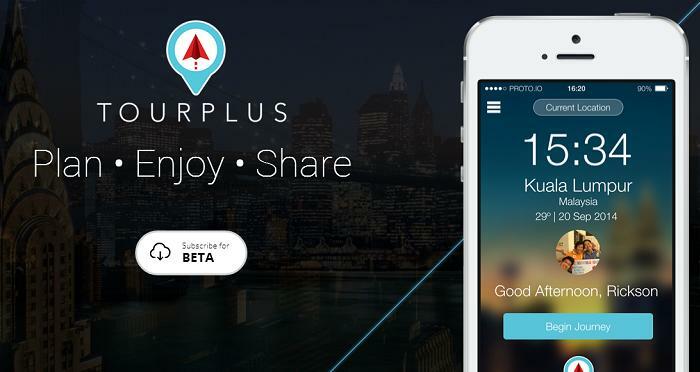 TourPlus is a travel assistant that will greatly simplify your travel planning and add a fun edge to your travelling experience. Rickson Goh, founder of TourPlus, told Vulcan Post that the team aim to have the app ready early this year. The app assigns ‘missions’ to the travelers that they can complete once they reach their destinations. For example, taking a photo with the KLCC tower in KL. After they’ve completed their missions, they will be rewarded with vouchers from shops nearby. Travelers can plan and share their itineraries via the site with everyone around the world. Forget about tour guides and complicated trip planning, TourPlus lets you see what others have done on the same trip so you can follow in their footsteps making changes whenever you think is necessary. Travelling on your own, or in a small group, is definitely more fun than travelling with a group of strangers and on a strict time schedule, after all. We are definitely looking forward to seeing this app on the appstore. Zuzanna, Seeties Communications Manager, describes Seeties as “a platform to share best local recommendations.” It obtains information from locals and shares the content through their site so that travelers can experience the new destinations like locals. Seeties is avaialble on the Google Play Store with the iOS app in the making. While there may be other travel sites out there, Seeties stand out such that it offers authentic recommendations of otherwise little-known places. Popular tourist destinations are often congested with other tourists eager to take selfies. 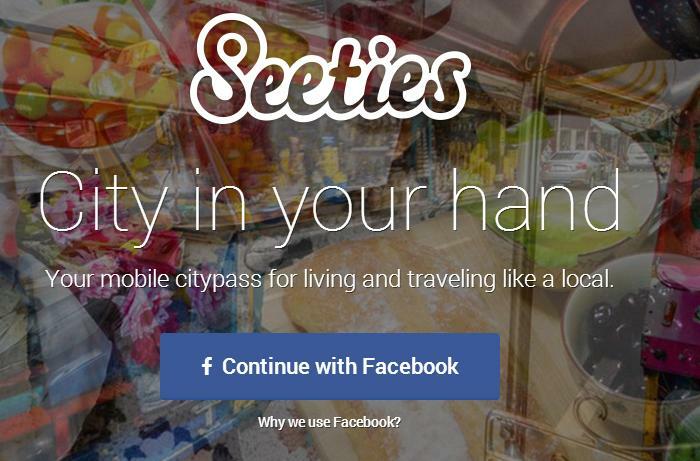 Seeties offers a non-tourist-book way of looking at the destinations, allowing users to travel like a local and enjoy all the things that locals do. Last minute holiday planning usually means pricey hotel stays. HotelQuickly is an app that lets you book rooms last-minute and at a discounted rate. 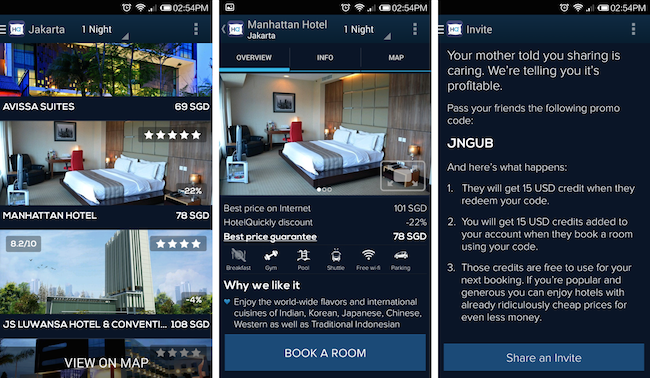 The app officially launched in Malaysia late last year and has been helping Malaysians everywhere get discounted hotel rooms. Whether you’re planning a holiday last minute, or just feel like relaxing in a hotel for a quick staycation, HotelQuickly claims to be able to find hotels at a price that is at least 28% cheaper than other online sites. Definitely worth a look in our opinion. 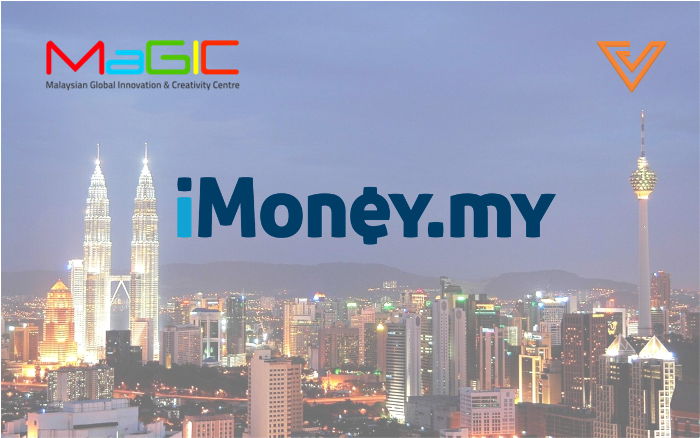 iMoney is kickstarted by Ching Wei, who, upon returning to Malaysia from Australia, realized that there was no site that can simplify the financial decision making process with readily available information from the internet. iMoney is not just about searching for the best bank, the site offers detailed comparisons for home loans, credit cards, personal loans, fixed deposit, car insurance, mobile plans and unit trusts, all with just a click of a button. iMoney is sure to gain traction in 2015, especially with people getting more careful money-wise. With the GST implementation this year, we might need this app more than ever. Borrowing money from a friend can be an awkward experience. Frenloan is an app that computerizes the process to remove the awkwardness of having to remind the friend to return the borrowed sum. The app is able to certify a loan to both lender and borrower by generating a digital Loan Certification. 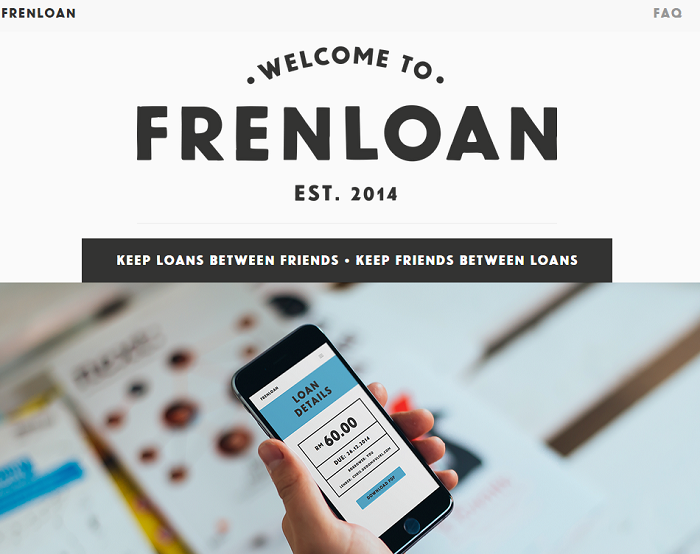 David Sin, founder of Frenloan, told Vulcan Post that he hopes the app can enable people with financial problems to get help from their close friends and family without getting themselves with serious debt issues and losing the loved ones in the process. While there may be many rooms available in the market, finding the right one is a tough decision. 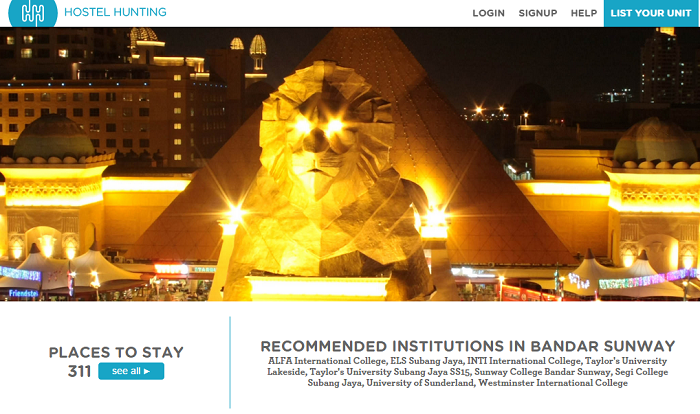 Hostel Hunting is the only room rental website that is focused on student accommodation. Joey Lim, one of the co-founders of Hostel Hunting, told Vulcan Post that their site is worry-free and hassle-free website that allows students to sieve through the accommodations located near their college and university, all from the comforts of their homes. The operators that doe not comply with the rules of Hostel Hunting are removed from the system and tenants are able to rate owners and properties in order to ensure that the quality is upheld. This student-focused website is bound to do well in 2015, what with the lack of these sort of sites available on the net. 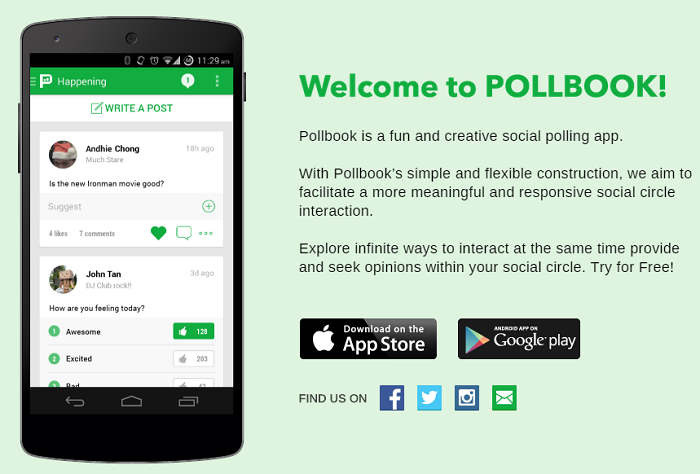 PollBook is a creative social polling app that gathers information and suggestions from your followers. The app is available on both the Apple App Store and Google Play store. Users are able to share their thoughts by either writing a post or creating a question and create a list of choices, after which their followers can respond by agreeing, disagreeing, or even adding their own options. Pollbook lets users understand what others are thinking and keep in touch with what is happening to people around them. Results are illustrated in bar charts so that the users can further visualise why those choices were made by discussion or self-reflection. Polls are the quickest way to get views and opinions from the public. As an app that simplifies how polls are made and answers are obtained, we are sure to see more of this in 2015. Hackerscape was founded just a few months ago in October 2014 and has since been getting the attention of creative Malaysians eager to learn new skills. It provides a space and platform for community of like-minded individuals, from tech enthusiasts to regular curious Malaysians to learn about courses such as 3D Printing and Design and Raspberry Pi. “We’ve seen so many people from different walks of life at the few workshops we’ve hosted so far; couples have attended together, parents and their children, college students, retirees as well as business professionals and startup founders,” co-founder Jia Shern shared with Vulcan Post. Malaysians are not just consumers, but also innovators and creators. Hackerscape creates a space and outlet for this creativity and a platform to nurture and learn about the skills that people are curious about. We’re eager to see more courses offered by Hackerscape in 2015, especially since the co-founders (Jia Shern and Clarence) have told us that Hackerscape is planning to offer classes on drone building and robotics! There are a whole variety of amazing, up and coming Malaysian startups that are bound to gain traction this year. If there really is something you could use that you don’t see anywhere on the internet, why not start your own? Having your own startup might be tough, but it’s not as impossible as you’d think. After all, it’s better to be late, then never try at all.